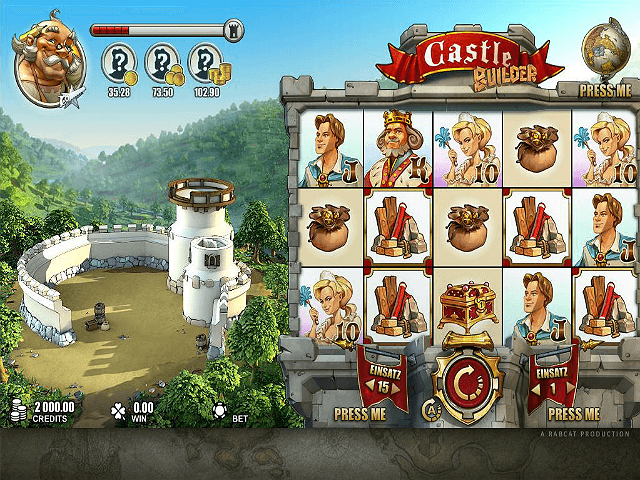 The Castle Builder online slot is a medieval-inspired game where building the most impressive castle you can will win the heart of the princess. Castle Builder software provider Rabcat Gambling has created an immersive 5-reel, 15-payline slot, taking the excitement of video slots and combining it with the addictive nature of The Sims. 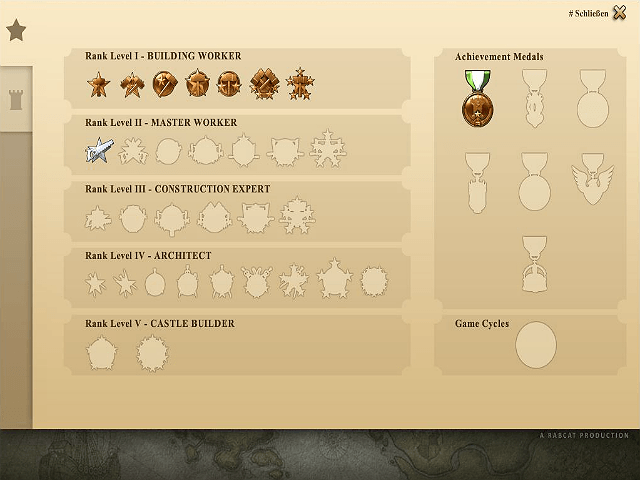 The best architects always plan their buildings, so read through this Castle Builder guide to lay the foundation for your rewarding gaming strategy! 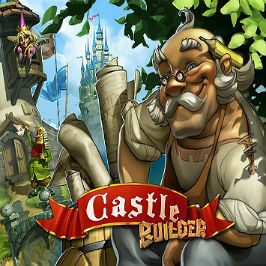 Castle Builder combines your typical online slot with construction games like Sim City and Prison Architect to give players something to aim for above and beyond winning money. Software designer Rabcat has successfully integrated a level-based system into its video slot, casting the player as a Royal Master-Builder in the age-old story of a princess choosing her suitor. Players are charged by royal decree to create the most majestic castles in three different kingdoms: Fortuna, Ethril, and Ilrian. The aim of Castle Builder isn't to bank money alone, but to collect building materials necessary for your current castle project. Ten castles are required in each of the three kingdoms, with each blueprint becoming increasingly exuberant and requiring more materials than the last. When a castle is finally completed, the princess will move in and choose her suitor – how rich he is determining the amount of gold you'll be awarded. As well as being fun and innovative, Caste Builder has a high return-to-player (RTP) rate of 96.47%. The odds of making money from your career as a royal constructor are in your favour! 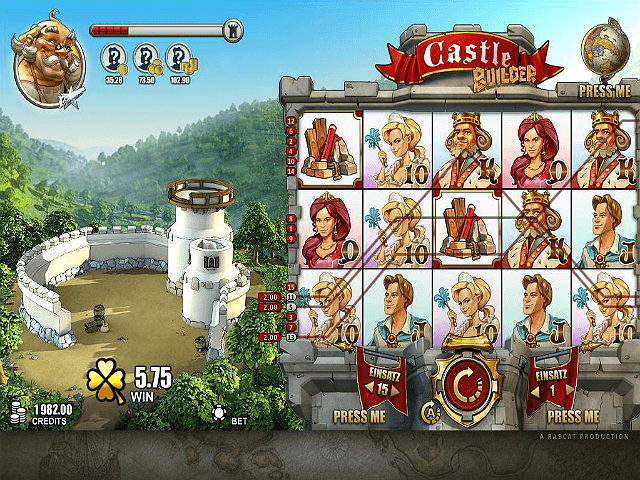 Understanding the fundamentals of online slot game Castle Builder doesn't require a degree in engineering. In many ways it plays like other video slots, where matching symbols across the 15 paylines, including traditional symbols like K, Q, J, and 10, are all part of the fun. In Castle Builder, however, these icons are fully embellished as actual Kings and Queens, with the Joker cast as a Prince, and 10 becoming the Princess. High paying symbols fit into the medieval monarch theme, with sacks of gold coins, treasure chests and creepy caskets to boot. The architect symbol acts as a the wild card, and can be substituted for every symbol and provide you with the most important aspect of the game: your building materials. These are what you need to hit to start construction of your castle, and can be earned by simply rolling a two or higher. The more building material symbols you score on one payline, the better the quality of the blocks. Two will create a standard block, three will give you bronze blocks, four will conjure silver blocks, and a full payline of five symbols brings forth those gold value blocks. Once a castle is finished, you'll move onto the next. As we said, there are three kingdoms including ten castles each. After that you get to build five more castles for the Emperor. Upon completion, the game finishes. Luckily, for those who cannot get enough of building castles and pleasing emperors and princesses, there is also a sequel with even more longevity and features: Castle Builder II. 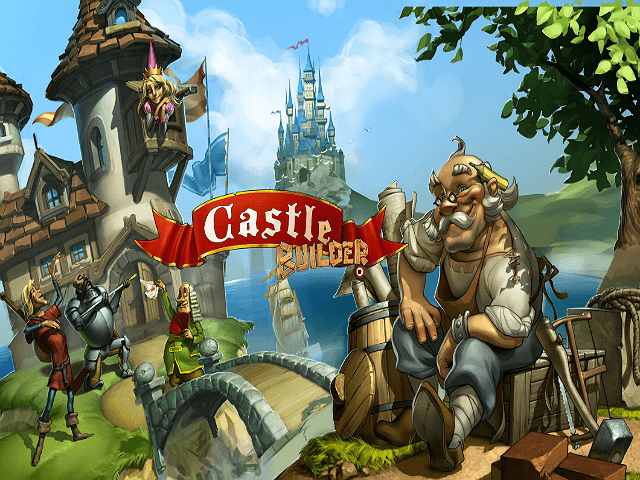 If you like Castle Builder - You'll like these slots too!